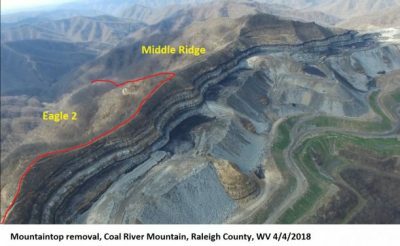 CHARLESTON, W.Va. – Today, a coalition of groups filed a federal lawsuit against mining company Republic Energy seeking to halt unlawful coal mining activities in Raleigh County, W.V. Republic Energy is mining one of the only remaining intact ridges on the heavily mined Coal River Mountain without a valid mine permit designed to protect water, air, and land on the mountain. “Republic has waited 10 years to begin mining the Eagle 2 permit. In that time, demand for coal has decreased substantially. There is no conceivable reason that this mountain should be mined at this point. What our communities need now is support in developing a new economy that benefits local people, promotes well-being, and preserves the environment. Mining at Coal River Mountain is more than just about a permit; this is our lives being erased to pander to the few wealthy coal corporations.” said Debbie Jarrell, Co-Director of Coal River Mountain Watch. The lawsuit against Republic Energy, a subsidiary of the largest metallurgical coal producer in the US, Alpha Natural Resources, seeks to enjoin all operations at the mine unless and until the company secures a valid permit. Surface mining permits terminate after three years if no mining has started and if the permit holder has not met the high standard for an extension. This permit was issued in 2008. Despite the fact that the coal mining company failed to start mining or to get the required extension in 2011, the West Virginia Department of Environmental Protection has unlawfully treated the mining permit as valid. But the company failed to request additional required extensions, and failed to offer a valid justification for why it waited an additional seven years to begin mining. Mining operations commenced in the spring of 2018 despite the fact that the company lacks any permit authorizing that mining. A new permit would take into consideration the most up-to-date information, including existing levels of water pollution from nearby mines, and incorporate up-to-date mining requirements. This is particularly important as adjacent permits on Coal River Mountain have accumulated multiple violations. For instance, Middle Ridge permit has been issued 11 notices of violation in the last two years, many of which arose from citizen complaints. The footprint of this type of mining is at an all time high due to its lack of efficiency, as mountaintop removal mining today is eating up three times the amount of land to produce the same amount of coal as it did in the 1980s and 1990s. Environmental groups and local communities, including Coal River Mountain Watch, Appalachian Voices, and the Sierra Club, have been advocating that mines on Coal River Mountain be replaced by wind turbines to bolster the economy while preserving what is left of WV mountaintops that have not yet been damaged by mountaintop removal mining. Appalachian Voices is a leading non-profit advocate for a healthy environment and just economy in the Appalachian region, and a driving force in America’s shift to clean, renewable energy.